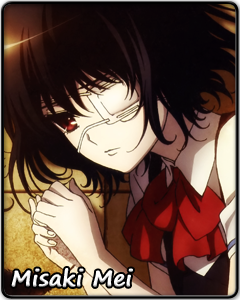 The voices surrounding Misaki Mei told her that she should not exist, that it would be better if she disappeared. And she said, "Fine." Mei knows well that words like "friends" and "family" hold little meaning. They refer to bonds supposed to keep people together, but are in fact little more than a naïve dream. All bonds in this world are feeble things, disappearing within moments of coming to be. There is nothing truly connecting Mei to this world, and nothing to prevent her from disappearing. Aware of the futility in everything happening around her, Mei keeps a distant approach to people and events alike. But even if the stage she is standing on is one of a pointless tragedy, Mei realizes that the show must go on. She has no choice but to play her part. As she speaks to the other actors, her words are always hints and riddles, never revealing more than she wants to. Only sometimes, she will stray from the script and point towards the hidden truth. It might seem that Mei has already given up on being anything more than a simple observer. But it is precisely because she stands in the eye of the storm that her actions hold grave meaning. When it is time for the curtain to close, will Mei remain indifferent to the world around her, or will she eventually find a reason to make her move?